Content is the most important element in any Digital marketing activity. Content Marketing by itself plays an essential role in determining the outcome of a campaign. Content is required across the customer lifecycle, and is an evergreen requirement by all businesses across verticals. Our in-house content creators (we don’t call them writers) who are experts at creating and designing content for your website, blog, social media, etc. with their innovative perspectives are our primary assets. We have a team of content writers who understand your business and customer requirements and craft content that can portray your business in the right sense and bring out the solution that you provide in the most appealing way. 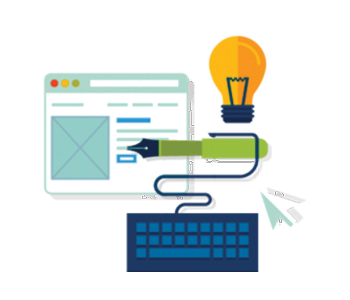 We can either develop content for your website right from ideation or alter them later as per your changing customer demands. Most of us in the team are bloggers and run our own blogs. This helps us in understanding every nitty-gritty of blogging and we extend that learning to our partners. We can help you create well designed blogs for your website on a day-to-day basis. Apart from blogs we can also generate quality backlinks and brand mentions for your business in the form of guest blogging, article writing, press releases, Q&A sites, etc. The content of your social media platforms is essential for engaging your audience and creating an everlasting impact among your followers. Besides creating attractive and thought-provoking graphics we also pump it up with high intensity copy.